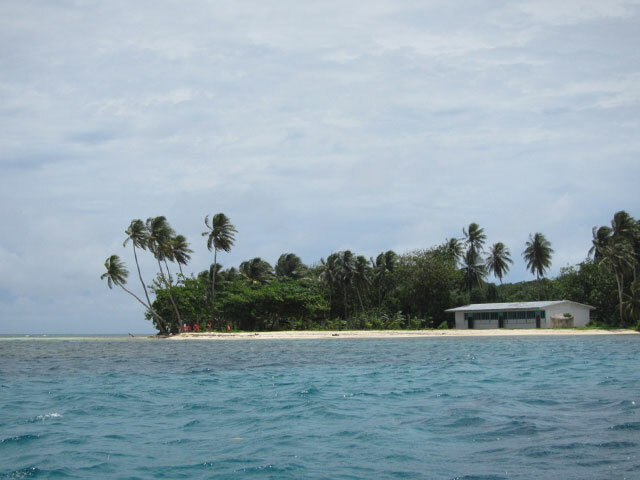 The tropical islands of Chuuk, part of the Federated States of Micronesia, remain largely disconnected from the Internet. More than an hour flight from Guam and over 3,400 miles (5,400 km) from Hawaii, most of the islands in Chuuk are isolated in a way that is hard to envision. While the main island of Weno (pronounced Wena) has a population of almost 14,000 and basic Internet access, most of the surrounding islands have only 350 to 4,000 people per island, limited cell phone service and are accessible only by boat. Students on the islands may have seen people use computers and the Internet on television but most of them have never actually touched one or been online. “A few [students], maybe 1%, have ever used computers, but most have not seen them,” one teacher on the island of Eot said. 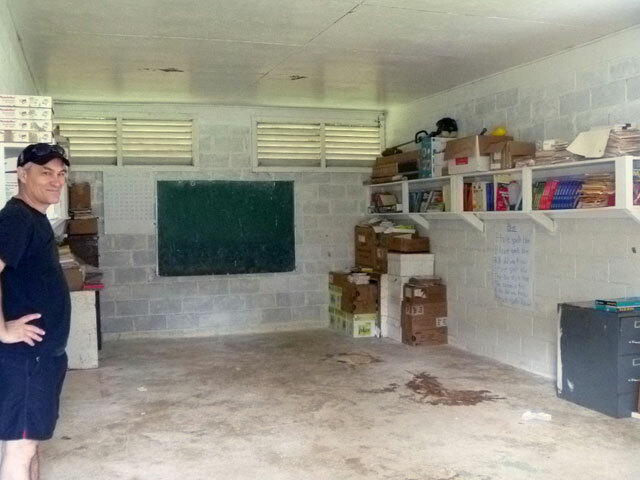 In late March Bjornson travelled with Bruce Baikie and Prairie Summer to Chuuk to conduct a site survey and local partner training as part of phase two of the Pacific Islands Schools, Connectivity, Education, and Solar (PISCES) Project. 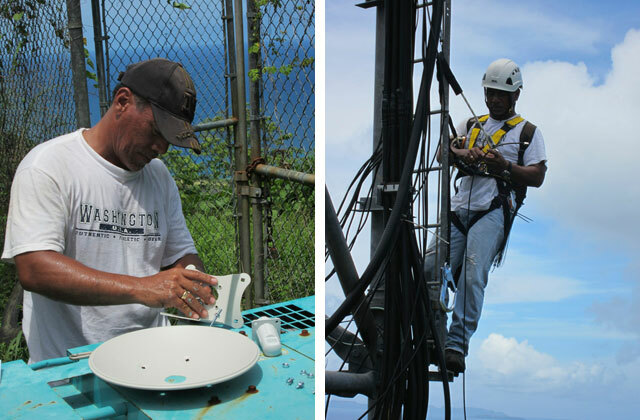 PISCES is a multi-stakeholder initiative to demonstrate how low cost wireless networking and solar-powered computing infrastructure can be scaled to serve educational professionals and students across the Federated States of Micronesia (FSM) and similar remote island settings. PISCES I, the first phase of the project, was implemented in 2012 and demonstrated that alternative, low-cost wireless networking and solar-powered computing infrastructure offer reliable and affordable computing and connectivity options for many remote and off-grid schools. The goal of this second phase (PISCES II) is to identify, connect and equip at least three schools on these remote islands, strengthen the local ICT capacity and increase digital literacy among teachers. For this project Inveneo’s team focused in on building the capacity of our local partner iSolutions and members of the local telecom to conduct site surveys, design wireless networks and install long-distance wireless links. Dr. Laura Hosman from Inveneo partner Illinois Institute of Technology (IIT) was also present, following up on the 6 low-power, ruggedized computers that were deployed in PISCES I on the island of Udot and assessing lessons learned during the first phase. 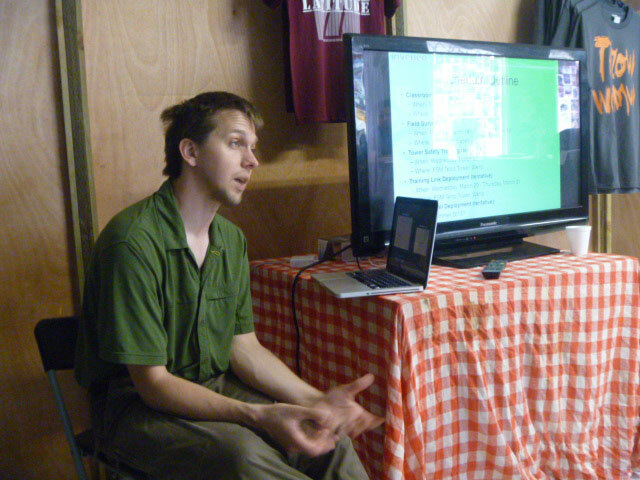 Dr. Hosman also gathered data to inform the design of trainings for teachers on computer skills and the deployment of additional computers in the new locations. Chuuk Lagoon with pins showing survey locations. The pieced-together nature of Google’s area maps highlights the remote nature of the islands. With the ambitious goal of conducting site survey training, six site surveys on six islands and installing one point-to-point link, the week was packed and the team was at the mercy of the weather. The heat, humidity, heavy rainfall (almost 200 inches per year) and unique challenges of making long-distance wireless links work over water make this equatorial island nation a difficult environment. Most of the smaller islands have no electricity and the vegetation is thick. Operations began with Bjornson conducting a full day of training with three iSolutions staff and two members of FSM Telecom followed by guided site surveys. These guided surveys allowed trainees to test their new skills while gathering valuable data necessary to design the wireless links. The training started with an in-depth session on the connection between tower equipment and a computer lab. Classroom time was balanced by hands-on training and exercises with the team conducting test surveys at various locations on Weno. In addition to learning many of the standard survey tools (including GPS and compass basics), the team also tested Inveneo’s new Smartphone-based Android application for conducting site surveys. 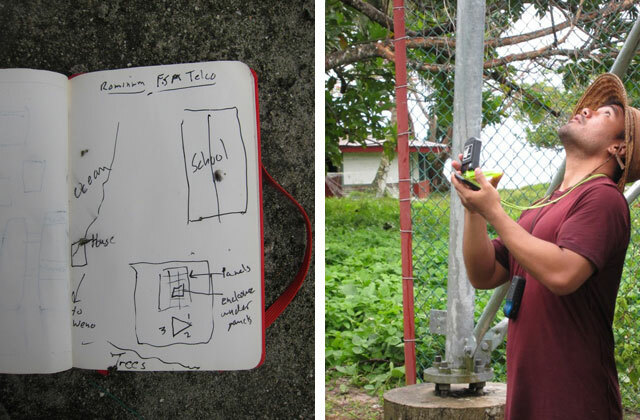 The group of workshop participants from both iSolutions and Telcom FSM are the first worldwide to use this new tool, integrating survey-specific GPS, camera, and note-taking capabilities into one convenient handheld device. Previously an engineer needed to bring an individual compass, GPS unit, camera, paper and pencil to collect all of the data. These Google-donated Android phones use a combination of services including Formhub and odkcollect to make site surveys faster and more accurate. With the training complete the team headed out to the surrounding islands to begin the site surveys. Heavy rain poured during the first three days, but not enough to stop the team from boating out to surveying the first three islands. When the rains let up the sun emerged giving the Inveneo team the opportunity to experience the full spectrum of weather challenges. From torrential rains to blazing sun, each day added to the understanding of what networks need to endure to function in Chuuk. 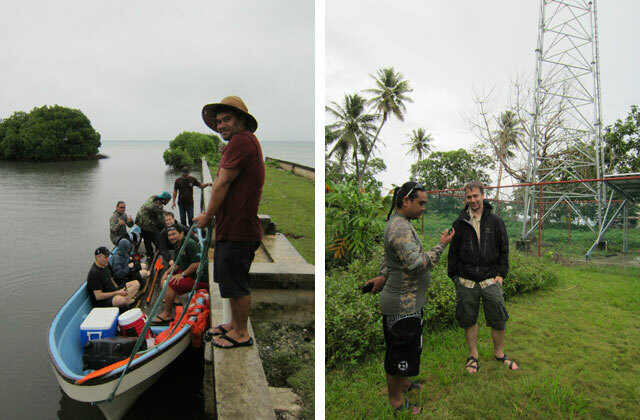 Site visits to Romanum, Udot and Eot islands were completed via boat in one day despite constant rainfall. The islands of Fefan, Tsis and Tonoas were surveyed on the following day. While each school and site has unique assets and challenges, all six of the locations surveyed are viable potential link locations. 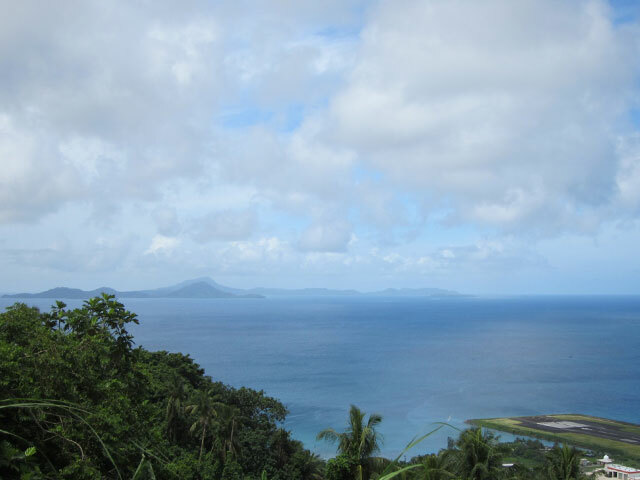 Many of the schools are conveniently located on the edge of the islands, clear of the dense vegetation that covers most of the islands, and even at the schools farther inland feasible locations were identified. This is exciting news for the PISCES team and the schools who will benefit from the link when it’s established. “What we are doing now is we are trying to improve our students’ performance, and it would be good to search what other schools are doing…on the curriculum and find ways to improve our teaching,” Nancy Seymour, principal and 1st-2nd grade teacher on Eot said. Her school does not have enough books and resources and she believes having Internet access could make all the difference – providing her and the other teachers a source for new lesson plans and ideas and introducing the students to new and foreign things. At every school the team visited there was a keen interest in connectivity and a universal belief that technology would make an impact on the quality of education. In addition to the academic potential, every single student and teacher indicated that they had family living either on other islands or abroad, and there was a great deal of excitement around the potential for communication with loved ones. With the site surveys completed, the next focus was to establish a long distance wireless link from the main island of Weno to the school on Udot. This link, temporarily established during PISCES I, needed to be moved to a more permanent location and the team had received permission from FSM Telecom to place the link on the telecom’s existing tower. This new position, higher on the island, allows for a stronger connection and will be the point that all six of the surveyed islands will link to when the project is completed. To install this long-distance link half of the team went to the tower on Weno and the other half to the site on Udot, coordinating via radios and cell phones. First the Udot team installed a small link on the side of the school. On Weno, the team put together a small dish, then mounted it on the tower and pointed it toward Udot. The positioning is critical and must be painstakingly adjusted to the most accurate position possible. Access to the tower was provided by FSM Telecom, which has a strong relationship with iSolutions. Inveneo has found through past experience that strong collaboration with the local telecommunications provider can be a powerful tool in creating sustainable projects. The team on Udot then adjusted the link on their end and the connection was established! Both the FSM Telecom and iSolutions teams did an incredible job. 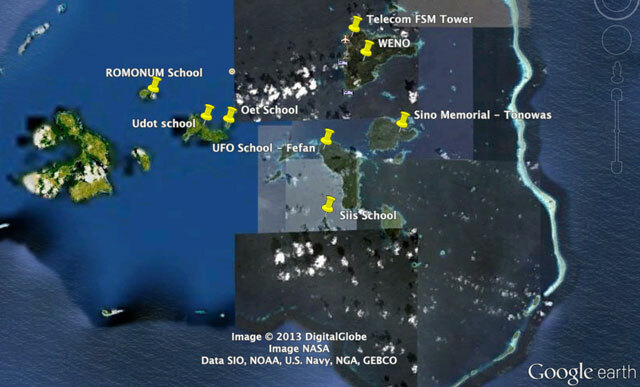 With the training completed and the first link established, and data gathered for five additional sites to be linked as soon as the funding is secured, PISCES II has the potential to provide unprecedented levels of connectivity and access to schools and communities throughout Chuuk. The project has also gained support and interest from the FSM Department of Education. 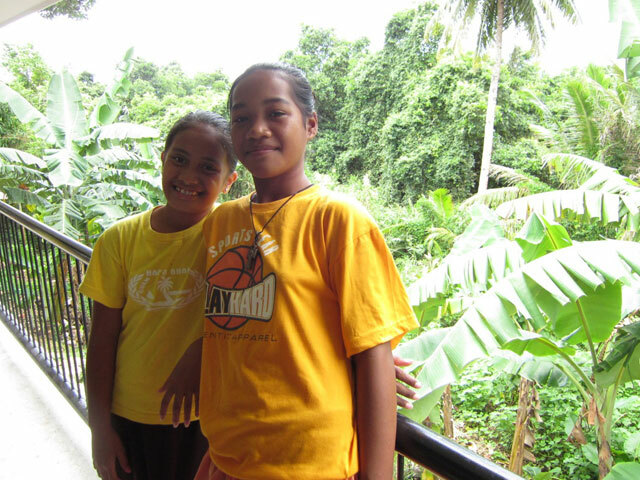 In addition to improving the educational resources and access to information, every single student, teacher and administrator the team met on this trip said they have family on other islands or in other countries. With this long-distance wireless network in place they will all have new ways to communicate with their loved ones in other places, and that may be the best motivation to learn of all. 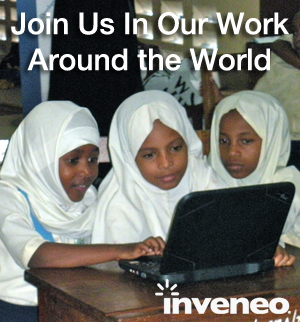 If additional support for this project can be secured, the Inveneo team plans to return and install links to the remaining five sites in the summer of 2013. The PISCES Project has received funding support from Google, the Pacific Telecommunications Council, and the Internet Society. PISCES Project partners include: Inveneo, the University of Guam, Illinois Institute of Technology (IIT), Pacific Resources for Education and Learning (PREL) Organization, Green WiFi, iSolutions, the International Centre for Theoretical Physics, the University of California, Berkeley’s TIER research group, FSM Department of Education, FSM DTC&I.